Foróige means Youth Development and the purpose of Foróige clubs is to enable young people to involve themselves consciously and actively in their own development and in the development of society. It gives them many opportunities to have fun, make new friends, think for themselves, reflect on their actions and take responsibility. It helps them develop strong characteristics and talents, acquire knowledge and skills for the future and improve their communities. 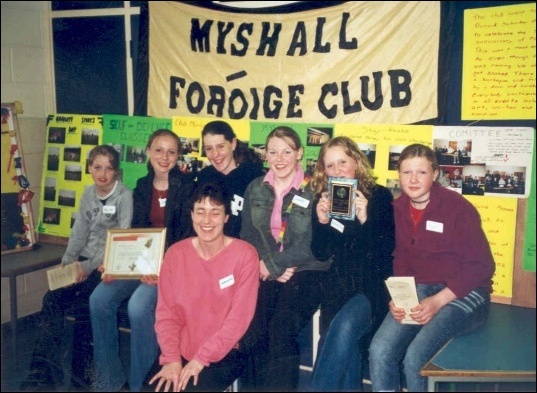 Our present club known as Myshall Foróige Club was set up in 1998 and has gone from strength to strength over the years. Club members are in the 12 to 18 age group and we meet once a week, from September to May, in Myshall Community Centre. Club activities include sporting activities – both Indoor and Outdoor, talent competitions, projects, arts and crafts, quizzes, discos, bowling, carol singing and other fundraising activities and of course there are Interclub activities. We also try to help out in the community when required. Clubs depend on adult leadership to run efficiently and we are always ready to welcome new leaders. We will be starting back after our summer break in September when we would love to have the opportunity of meeting new members and leaders.